Looks like a nice one caught at the Vanity this year. 15.37 lbs. Obviously you're there , but are there any first day results online ? Dad said guys were buying minnows like crazy when he was at the coop getting fuel Thursday. How's the bite otherwise ? Wonder if it was caught pulling cranks or rippin glide baits. Most anglers Lindy rig or bottom bounce. Most anglers as in this tournament or in general? I fished tournaments on the north, south and sk. trail for about 25 years and I would say probably 90% of the anglers are lindy rigging or pulling bouncers. Their are always exceptions and depending on the body of water and time of year there are always some that will be jigging or slip bobbing. What ever works eh. Always seems to take a while for newer strategies to take hold here. Lindy rigging and bouncers became popular up here in the mid to late eighties when the tournaments started and that is when I started using them. I think its easier to cast/troll plugs and spoons but because it is so difficult to pull these at a precise depth and speed they were not really popular on the tournament trail. Spoons and cranks will catch fish without a doubt but my experience for the majority of the time rigs and live bait will outfish cranks/spoons at least 5 to 1 and even higher in tough conditions, but there are always exceptions. For me going walleye fishing and not using a lindy or spinner rig would be like going fishing without sonar/GPS, you will still catch fish but your success will be far far less. 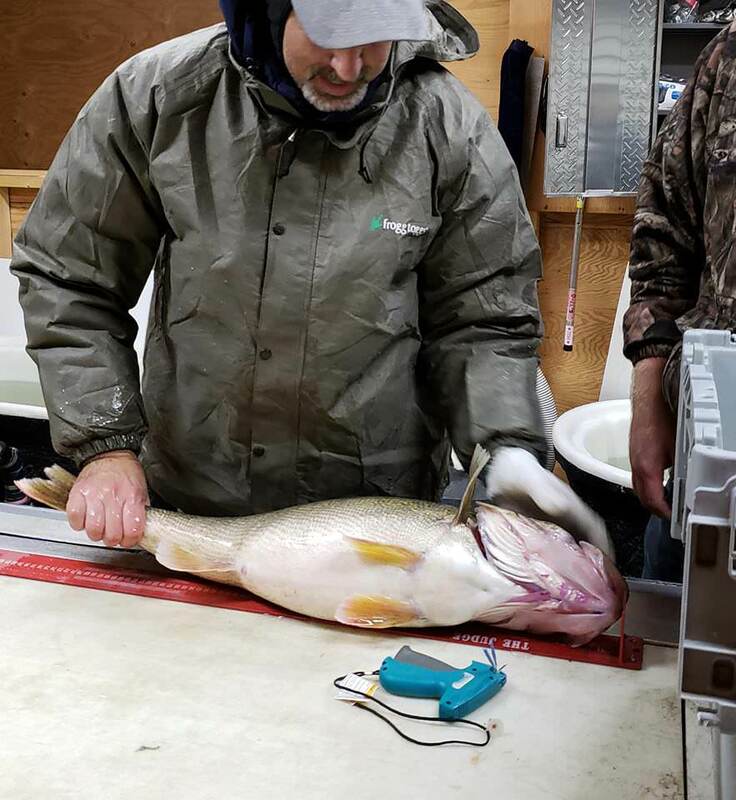 IMO there is no greater "search" presentation for walleye than a bouncer rig, varying speed and depth while staying in the strike zone is such a versatile presentation. It is especially effective in the spring and fall transition seasons when walleye can be spread out. The water this derby is on, is fished this way by 99% of the anglers all summer. In general, I would say it is the most common way to catch walleyes. When people mention Tobin Lake, many are actually referring to the river that flows into Tobin. Sounds like you may not have fished Tobin Lake. Tobin Lake was formed by 2 dams on the Saskatchewan River. When they flooded the area they did not previously log it out hence there is still lots of standing timber in the lake and the amount of sunken dead fall in there is VERY large. Hence you loose lots of tackle. A spinner and lindy rig are fairly cheap, especially in comparison to crankbaits. If one is very careful and only troll over the old river bed area one can fish cranks fairly successfully. Though during the tournaments it gets pretty crowed so trolling cranks become even more difficult with the level of precision needed. Baits in the Saskatchewan River must be presented at the speed of the river - at the bottom. It follows then that the boat must be travelling at the same speed, a tricky thing to do given that the current speed in the boat zone is somewhat different from that of the strike zone. Trolling a crank bait should be done while motoring upstream or out in the lake itself, made possible this year by extending the boundary somewhat. We had limited success at the eastern marker buoys with deep divers and line weights. Take a tip from the stated opinion that there was a run on minnows at the bait shops. The big fish were quite likely jigged up from the bottom with 1/2 oz. or 5/8 oz. jigs from three or two deep pockets in the river channel. Heavy jigs with light wire hooks (and a stinger) were needed to maintain a vertical presentation. It also stands to reason then that there were upwards of 50 boats gathered at these spots and boat control was critical. Not a lot of room to pull blades at 1.1 mph when all the rest of the gathered fleet were travelling anywhere from 0.2mph to 0.7 mph depending on the outflow from the dam plus the effect of the wind. Not to mention the snow and the freezing temperatures. Sadly for us, we were only able to land slot fish, some of which were either I/8" too long or 1/4" too short. Plus a few unders and two monster pike. I am sure there were some jigging, but pulling smiley blades and spin-n-glows can be pulled at .2-.7 easily and there were probably some still lindy rigging just with a heavier weight and a single hook or phelps floater. I caught my biggest an 11.2oz (which isn't really big for there) at Whiterock with a lindy and a phelps floater a few years ago. I haven't been for a few years but it is a fantastic fishery and a "must do" if you are a walleye hound. If you're fishing Tobin, spend some time on Codette. Its quickly becoming the next Tobin for fish quality. There's a reason why more and more locals are fishing it every year.